The historic area of Colonial Williamsburg VA is a great Virginia travel destination. It covers more than 301 acres, and includes about 90 original 18th-century structures. In addition, there are tons of houses, shops and public outbuildings which have been reconstructed on their original foundations. Some are open to the public, and some are private residences and administrative offices. Look for the flag at a building's entrance which will let you know whether that site is open. Williamsburg ranked third in Smithsonian Magazine's list of 20 Best Small Towns to Visit in 2014! My husband and I first visited the area very early on when we began dating. It was a very romantic date. We've been all over Virginia Travel to historic sites is one of our favorite activities. It's so neat to see all the costumed interpreters performing duties that early colonial settlers would have done. You can speak to them and they will answer just as though they are living in those times! It's fascinating to hear what their thoughts are about the current state of affairs and what they think the future holds. 18th century costumed re-enactor demonstrating the art of wood carving on the Village Green in Colonial Williamsburg VA. The animals are authentic as well. You'll see all the sheep, oxen, cows and other animals that would have been seen during the early days. You can even enter homes and look around inside, to see what types of furnishings and household gadgets they had back in the olden days. I like to see how they made things back then, so the buildings that are of special interest to me are the blacksmith shops, the weaver's shops and the kitchens. 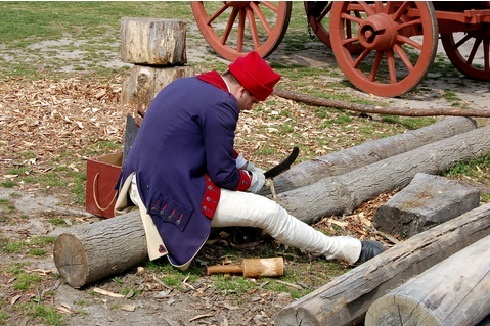 There are a total of twenty trades practiced using 18th-century methods and tools. Take VA-205 towards Oak Grove. Turn RIGHT onto VA-3 (at People's Community Bank). Turn LEFT onto US-301 S.
US-301 S becomes VA-207 W.
Merge onto I-95 S toward RICHMOND. Merge onto I-295 S via EXIT 84A on the LEFT toward ROCKY MOUNT NC/RICHMOND INT'L AIRPORT. Take the VA-143 exit, EXIT 238, toward US-60/CAMP PEARY/COLONIAL WILLIAMSBURG. Merge onto VA-143 E toward WILLIAMSBURG/JAMESTOWN/YORKTOWN. Turn RIGHT onto VA-132 S.
Turn RIGHT onto S BOUNDARY ST/VA-5. Turn LEFT onto VA-5/JAMESTOWN RD. End at Williamsburg, Virginia. Travel a short distance from there to the historic area. If you'd like to make a weekend of it, you can stay at one of the many local hotels in Colonial Williamsburg VA.